Ahla Fawda (The Best Chaos) have been running a "Warm Feet Campaign" collecting winter shoes and boots for distribution to Lebanese, Syrian and Palestinian families in some of Lebanon's poorest areas. 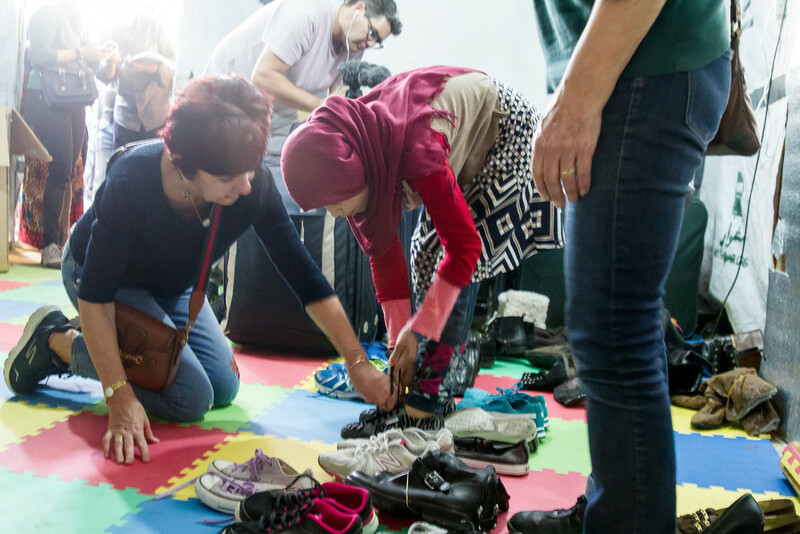 Donated shoes were laid out so that folk could choose what they liked and then our volunteers helped to size and fit. Its always sobering to remember that people run away from their homes and country in fear for their lives. They then exist in limbo, waiting to return, enduring harsh conditions, increased poverty and sometimes little sympathy for their plight. Their smiles, welcome, stoicism and generosity are a reminder that being generous is when we give more than can be afforded rather than what is convenient. Wonderful idea....shies are discarded well before they are finished so it's great to see them passed on! I know I have chucked our shoes for some reason or other but still plenty of wear in them. Safety, food, shelter and clothing are what we all need to live. This is a nice reminder. Hello Ruth! I so admire your generous heart and how devoted it is to the volunteer efforts underway in your area. I continue to learn so much from your beautiful photography and compelling narrative, and I've enjoyed following you on FB since I was last on 365. Anyway, I'm back, and following your incredible project again. I'm so grateful to get the real story from you!! Being Jesus's hands and feet! Love this! @ruthmouch I would love to hear your philosophy of photography!